July 2018 Student in the Spotlight… Amelia! Amelia has been dancing at JC Dance since she was 4 and attends Ballet, Modern, Tap and Limbering. 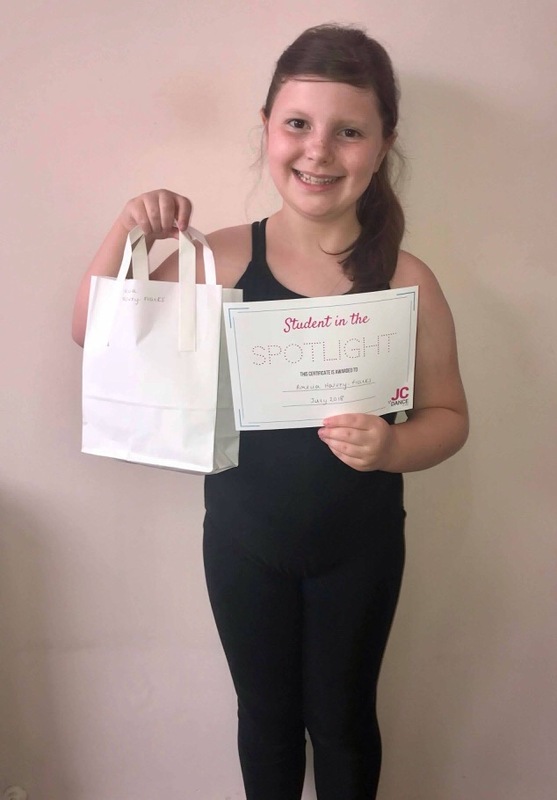 Amelia has been awarded Student in the Spotlight for her dedication to classes; she rarely misses a lesson and is very conscientious in terms of practising at home (particularly in the lead up to exams). Amelia is also very worthy of the award due to her increased confidence in class and it’s lovely to watch her dance and really enjoy herself and immerse fully in whatever she is doing. When asked what her favourite thing about dance was, Amelia replied that she ” loves everything about dancing, especially the shows. She likes that it makes her feel confident and special” Well done Amelia!